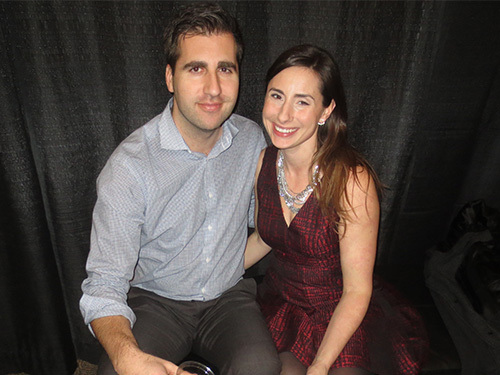 Michelle and her husband Peter Rowbotham at our 2015 Christmas Party. When Michelle Wickerson came in to interview for a position at Distress Centre (DC), what would be her first job in the social work field after completing her bachelor’s degree at the University of Calgary in 2002, her interviewer, Joan Roy, had already filled the role. “We were advertising for CCCs (Contact Centre Coordinators) and I had interviewed a number of people, and I interviewed Katie Ayres, who used to work here, and I fell in love with her right off the get go and hired her,” explained Joan, who is now Executive Director at DC. “And then I got this email from Michelle and I didn’t have any more room, but I thought, well I’ll bring her in for an interview. The position was already filled but Joan said she simply had to have her. She consulted with Executive Director, Barb Litchinsky, and decided to hire her as a relief CCC who provides extra coverage in the contact centre when needed. Michelle in our contact centre in 2005. After working as a CCC for a couple of years she returned to Montreal to complete her Masters of Social Work and began working in Montreal. 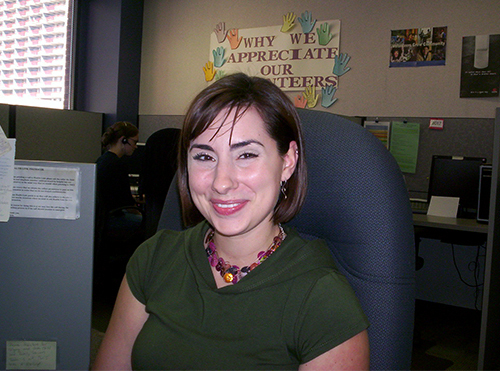 When the position of Volunteer Program Supervisor became available, Michelle’s name came up. She returned to DC as the Volunteer Program Supervisor in 2006, and spent the rest of her professional life at DC in a variety of roles including Communications Manager & Senior Manager of Communications & External Resources. She went on maternity leave in 2013 and her and her husband Peter had their daughter, Norah, before returning as the Senior Manager of Organizational Performance in 2014, and finally as the Director of Innovation & Strategic Initiatives before she went on medical leave in January 2016. She passed away on July 4, 2016 at the age of 35. 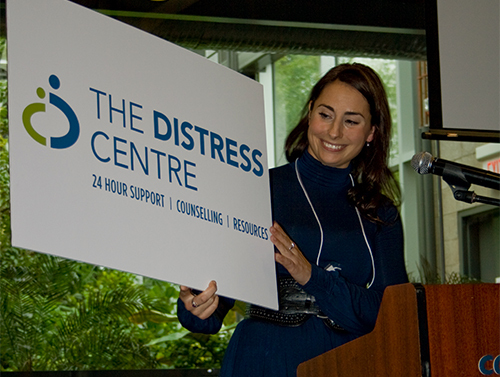 Michelle was a beloved mother, wife, daughter, sister and friend, as well as an exceptional part of the Distress Centre team. 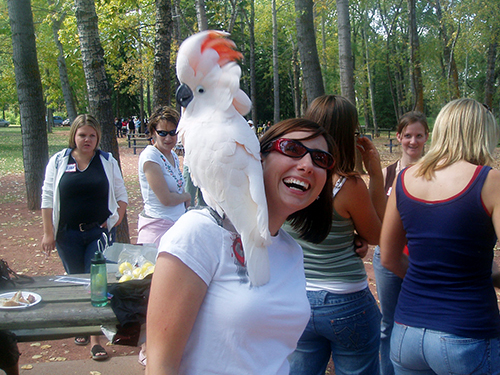 Distress Centre staff picnic, 2006. She brought a passion and drive to every role she worked in, every project she managed, and every person she worked with, supervised or mentored. With Michelle, there was no doing things half-way. “Michelle was super fun-loving, funny and such a great story teller, but even with her private life or with her work, she attacked it. She just dove in there, it didn’t matter if it was snowboarding or rebranding, she went in and did it,” Joan said. Her impact at DC is immeasurable. She headed up the rebranding of DC and ConnecTeen in 2010, work which got her listed as one of Avenue Magazine’s Top 40 Under 40 in 2012. She pushed for the expansion of our online services, believing it was the future of crisis intervention. Unveiling our rebranding at our 40th anniversary celebration in 2010. “She always found a way to make the mundane things more fun,” Jerilyn said. Jerilyn believes that Michelle’s impact will be felt for years to come. 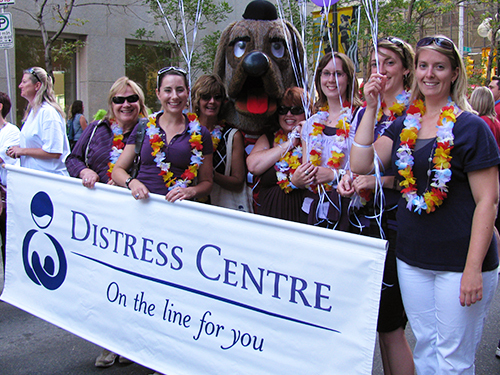 Michelle with Distress Centre staff at the United Way parade in 2009. The loss of Michelle has affected the staff at DC greatly. The nature of our work at DC and in the non-profit world often leads to close personal and professional connections. 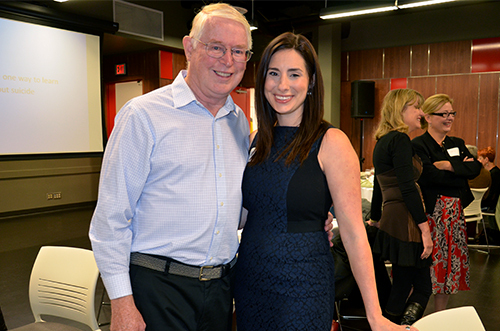 We wanted a meaningful way to honour Michelle’s memory and her legacy, and from that yearning it was decided by the leadership team to rename the Distress Centre Calgary Award in Social Work to the Michelle Wickerson Memorial Award in Social Work. It is awarded yearly to a University of Calgary student who is interested in working in the area of crisis intervention. “Her impact is not just about the work and projects that she did, it will continue to live on in the people that she worked with, supervised and mentored,” Jerilyn said. This scholarship helps to continue that impact. A renaming ceremony for Michelle’s award took place on November 29, 2016. 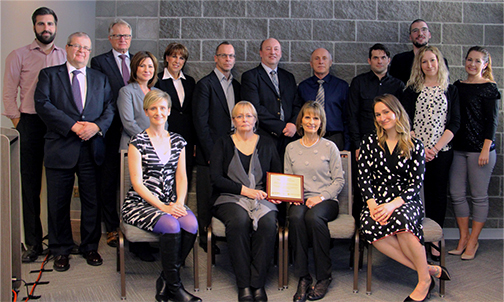 Top, from left to right: Peter Rowbotham (Michelle’s husband), David Rowbotham, Dale McMaster, Tania Loftsqard, Corinne Rowbotham, David Kirby, Jackie Sieppert, Tom Wickerson (Michelle’s dad), Ryan Wickerson (Michelle’s brother), Joe Theriault, Jenifer Snell and Shana Eriksen. Bottom, from left to right: Jerilyn Dressler, Joan Roy, Dianne Wickerson (Michelle’s mom) and Janice Theriault (Michelle’s sister). Michelle’s brother, Rob Wickerson, was not able to attend. Michelle was to be an integral part of DC’s future, and unfortunately, we have been robbed of that future. We are confident that we have the people to soldier on and continue to create a successful future for our agency, and part of that confidence comes from Michelle’s own belief in our work and in our people. We are so grateful to Michelle for everything she did during her 11 years here. We feel blessed to have had her in our lives. We miss her every day. Donate to the Michelle Wickerson Memorial Award in Social Work. 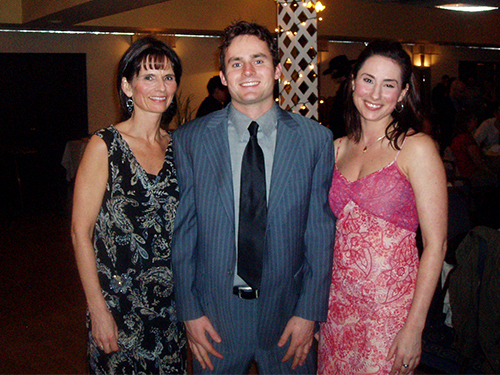 Michelle with her mom, Diane Wickerson, and brother, Rob Wickerson, at a banquet in 2007. 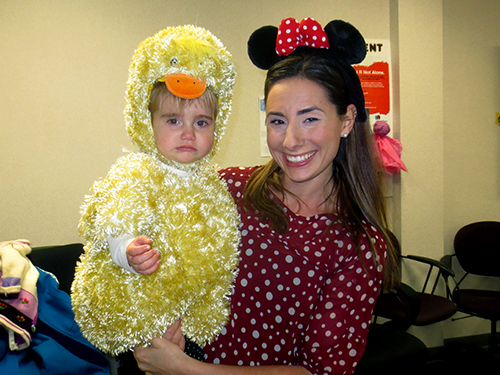 Michelle with her daughter Norah at our office Halloween party in 2014. 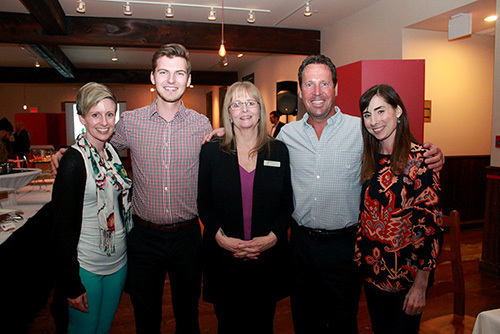 From left to right: Jerilyn Dressler, Greg McKiernan of LAN Solutions, Joan Roy, Mark Allison of LAN Solutions, and Michelle at our Volunteer Appreciation Event on April 28, 2016. Michelle with crisis line volunteer, Lorne Haggarty, at our 2013 Lend An Ear Breakfast.